To untangle the knot of interlocking meanings of these painted words, logophile and mythologist Phil Cousineau begins each fascinating word entry with his own brief definition. He then fills it in with a tint of etymology and a smattering of quotes that show how the word is used, ending with a list of companion words. The words themselves range from commonplace -- like biscuit, a twice-baked cake for Roman soldiers -- to loanwords including chaparral, from the Basque shepherds who came to the American West; words from myths, such as hector; metamorphosis words, like silly, which evolved holy to goofy in a mere thousand years; and words well worthy of revival, such as carrytale, a wandering storyteller. Whether old-fangled or brand new, all the words included in The Painted Word possess an ineffable quality that makes them luminous. "The English language has been far from pure, as speakers have taken languages from anything and everything they encounter. 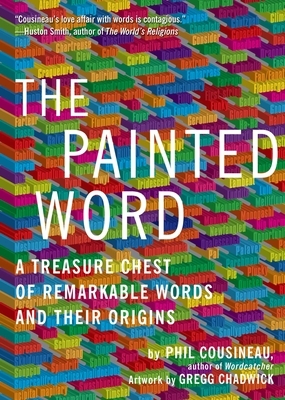 The Painted Word: A Treasure Chest of Remarkable Words and Their Origins explores the origins of many words we use, and their evolution throughout history. From compound words that become simply words, loan words, and how words lost all meaning to pick up another one entirely. The Painted Word is a worthy addition to any language studies reference collection, recommended." "Reading the pages of this beguiling paperback, we sense Cousineau's delight and enthusiasm for words and their ability to enchant and mesmerize. The set-up is sharing a special word, delivering a short essay on it, and then listing companion words that are close to it. Some of our favorite entries are ensorcell (to bewitch or enchant), fathom (to understand the depths), flabbergast (to astonish), flamboyant (theatrical), gloaming (twilight), plucky (courageous), and voluptuous (desirable). Pass The Painted Word on to your friends or family members who love books in the way Kenko does: "The pleasantest of all diversions is to sit alone under the lamp, a book spread out before you, and to make friends with people of a distant past you have never known."" "Fun, fiasco, pandemonium, checkmate, swashbuckler, ubuntu, dromomaniado you know the stories behind these words? Phil does and he shares these and hundreds of other words in his latest book." "For most of our busy lives words are mere tools. Not so with The Painted Word. Here, they're not mechanisms or background music, they're the beloved riffs of favorite songs mesmerizingly amplified through borrowed speakers. So you find yourself sitting a while and really listening to nuances you have never quite heard before. I sat a very long while with Phil's inspiring collection of words and the unexpected commonness of so many of them made the finery of their generously-revealed attributes all the more spellbinding." "When Phil Cousineau and Gregg Chadwick join creative forces it is an important event. This historic collaboration shines with fresh insights into both language and art." "If The Painted Word were a club act, I'd sit there drinking in Cousineau's revelations, tales and mythologies until they kicked me out of the joint. Reading this brew of etymology, history, lore, and pop connections, with lambent illustrations by Gregg Chadwick, is just as intoxicating. A Cousineau riff on a (passionately selected) word is like Mark Twain meets Coleridge meets Casey Stengel meets---well, everyone who's fun and informative, whether the riff is on autologophagist (someone who eats his/her words) or jack, which, believe me, the world-traveled Cousineau knows when it comes to language. " "Phil Cousineau’s The Painted Word is a gift to anyone who loves words. From bafflegab and bloviate to skirl and snollygoster, Cousineau builds a carousel of words” that will infuse any reader’s vocabulary with new life." "This historic collaboration of writer Phil Cousineau and artist Gregg Chadwick shines with fresh insights. "The Painted Word is Phil Cousineau's Pointilist Portrait of the Artist As A Mirror of His Words. From the Yiddish roots of Copasetic to the cracked art of Craqueleur, Cousineau's latest Portrait of Our Language is his own warmly personal Rembrandt masterpiece!" "This delectable banquet of words in The Painted Word is a welcome antidote to the bland and pallid pablum that too often passes for language nowadays." "Phil Cousineau takes us on an insightful journey to discover the essence of ideas that form our thoughts and feelings. It’s a masterful detective story that crosses continents and centuries to uncover the meaning behind the core elements of our own culture. He reveals how everyday words developed from mythic metaphors, and how many fantastic concepts sprang from hilariously mundane things. Words are how our minds make pictures. The book paints a fascinating landscape of how the history of these tools of thought helps us make sense of the world we live in, and ourselves." The masterfulness of The Painted Word is its re-telling of lost tales, illustrating the absurdities, tragedies and comedies of wordsall through Cousineau’s detailed, cinematic storytelling, which includes babbling parrots, bawdy 18th Century lairs, pirate Bugis of ferocious seas, and hundreds of other word stories." "Having opened the treasure chest that is language in Wordcatcher, Cousineau joins us in plunging our hands deep into its riches and tossing glittering coins -- "Carousel! Monogashi! " -- high in the air. The Painted Word is a celebration that brings the glamour back to grammar."